Taco Bell's website and social media platforms went dark on Tuesday morning as part of a campaign to promote the chain's new mobile app in a way that would make it stand out from rivals. IRVINE, CA: Taco Bell’s website and social media platforms went dark on Tuesday morning as part of a campaign to promote the chain’s new mobile app in a way that would make it stand out from rivals. "Taco Bell is a brand of firsts and we like doing things that have never been done before," Tressie Lieberman, the company’s senior director of digital marketing and platforms, told PRWeek via email. "Thousands of apps launch daily so we knew it was important to breakthrough with an integrated launch." To kick things off on Tuesday, Taco Bell held its first live stream for staffers, where senior executives – including the company’s president Brian Niccol, COO Mike Grams, and Lieberman – revealed the free mobile ordering and payment app. The new tool grants users access to every Taco Bell ingredient to customize their order, pay securely, and pick it up at the store. Taco Bell’s Twitter, Facebook, Tumblr, and Instagram channels stirred conversation by abruptly going dark to communicate that "the new way to Taco Bell is only in the app," Lieberman explained. 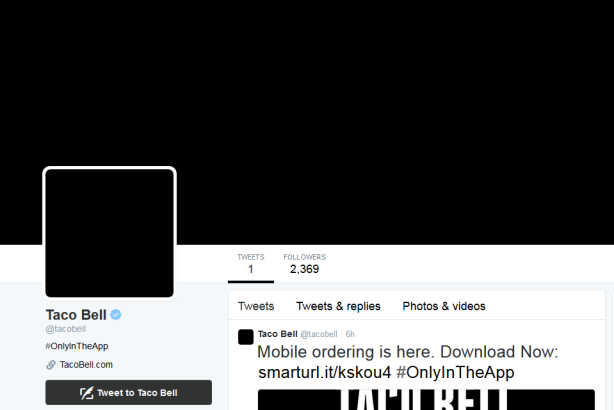 The home page of Taco Bell’s website was completely blacked out on Tuesday. In addition, Taco Bell created the Twitter handle @totallynothere and removed all previous content from its social media pages. On Instagram, Taco Bell posted a series of fragmented text-based images with the hashtag #onlyintheapp. The brand’s Facebook and Twitter pages remained blank until late morning when the chain posted the message: "The new way to Taco Bell isn’t on Twitter. It’s #onlyintheapp." The message also included a link to download the new app. Online food magazine Eater wrote on Tuesday that Taco Bell’s "going dark" strategy might run the risk of consumers mistakenly thinking the chain is closing. But Taco Bell’s chief public affairs officer Amy Kavanaugh told PRWeek via email that the company is not concerned with this possibility. "Taco Bell’s fans are so passionate that we knew by going dark we would actually ignite conversation about the brand and the new mobile app," she said. With PR and media relations assistance from Taylor, Taco Bell sent out a press release late Tuesday morning outlining details about the app. A mobile demo video was also created by the company to show the app’s features in action. Niccol said in the press release that the app is "just the beginning" of how the chain is using technology to become more transparent with customers about its food. The app reinforces Taco Bell’s commitment to be even better and more relevant for customers, operators, and staffers, the release explained. With regards to whether or not the app means the end of Taco Bell’s presence on social media, Lieberman said it is doubtful. "Today, we are very excited to launch our new mobile ordering and payment app and have already seen our fans make #onlyintheapp trend on Twitter," she said. "Our community is pretty amazing and they inspire us, so we won’t be able to stay away for too long." By providing customers with another way to access the store, the app supports the brand’s commitment to reach its goal of doubling revenue to $14 billion and adding 2,000 locations over the next eight years, according to the release. Before the reason for the blackout was unveiled, the campaign created buzz on social media as members of news outlets and the general public scrambled to figure out what was going on. What did you animals do to Taco Bell while I was asleep? S/O to Taco Bell for a smart #viral ad thing this morning. Media Twitter is noticing in a big way.